Urtuk is a survival adventure RPG with tactical turn-based battles in a dark, low fantasy world. Urtuk has suffered a mortal disease, a mutation in the Sanatorium. With every day, his health condition worsenes.. Now he searches for a cure in the world. It's only matter of time, when his mutation evolves to a level, when he finally dies. The world is set into dark, grimy theme. There are no classic fantasy beings like elfs, dwarfs or dragons, nor powerful magic, although there are some light magical features involved. Many centuries ago, there were powerful Giants roaming the world. They lived peacefully with humans until a war between Man and Giant began. Now the Giants are extinct. Some years ago, few librarians studied the bones and remains of ancient Giants. They did experiments and found out, they can extract a mystical fluid from their remains - Life Essense. With this, they could add many beneficial elements into human body. Not yet known, what exact impact this fluid on a human has, the experiments continue.. Very often, instead of improving the health condition of the targe, an opposite effect would take place, inflicting a mutation or lethal disease. This was the case of Urtuk. If you like a more direct communication with us, please join our Discord server. For Windows: download file "urtuk-prealpha-combat-demo-0.75.8.win.zip", then just unzip and execute "urtuk.exe". No other dependencies (like java,c++,..) are required. For Mac: download file "urtuk-prealpha-combat-demo-0.75.8.mac.zip", then just unzip and execute "urtuk". No other dependencies (like java,c++,..) are required. For Linux 32-bit: download file "urtuk-prealpha-combat-demo-0.75.8.linux-32bit.zip", then just unzip and execute "urtuk". No other dependencies (like java,c++,..) are required. For Linux 64-bit: download file "urtuk-prealpha-combat-demo-0.75.8.linux-64bit.zip", then just unzip and execute "urtuk". No other dependencies (like java,c++,..) are required. Note: This is a pre-alpha combat demo. 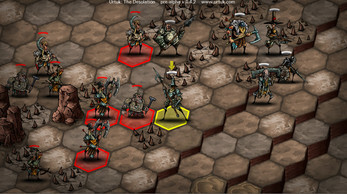 It features battle arenas along with interactive battle advisor tips. The world campaign is not included yet and will come later on. Go to Control Panel > Hardware and Sound > Power Options > Edit Plan Settings > click "Change advanced power settings"
set On battery to "Maximise performance". set Plugged in to "Maximise performance". When does Urtuk offfical launch?